Wesley Matthews may no longer be a member of the Dallas Mavericks but he still sent his congratulations to Dirk Nowitzki for becoming the sixth all-time scorer in league history. Super rookie Luka Doncic saw his hilarious post and reacted accordingly. 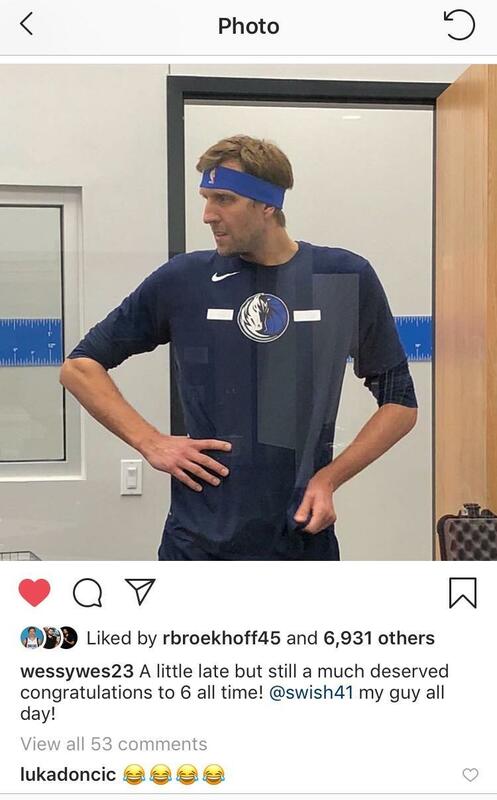 Via Instagram, Matthews — now a member of the Indiana Pacers uploaded a funny photo of Nowitzki as his congratulatory post. A little late but still a much deserved congratulations to 6 all time! @swish41 my guy all day! Matthews, who spent three and a half seasons with the Mavs, definitely has lots of love for the franchise and his former teammates. Though he spent just half a season with Doncic, you can tell that the two formed a tight bond. Nowitzki passed the great Wilt Chamberlain to become the sixth all-time scorer in league history. Though people have tagged this year as his last season, Nowitzki himself hasn’t confirmed their speculations. Fresh rumors even reveal that he might sign another year with the team. But statistics reveal that Nowitzki doesn’t have enough gas left in the tank for another season. For the season, he’s playing a career-low 13.7 minutes per game and has come off the bench in 30 of the 40 games he’s played in. He’s also shooting just 30 percent from the 3-point country — his worst since 1999 (his rookie year) where the German shot just 20.6 percent. But the decision is still up to him. Will the 40-year-old ink another deal with the Mavs? Or are we closing in on the end of an era?